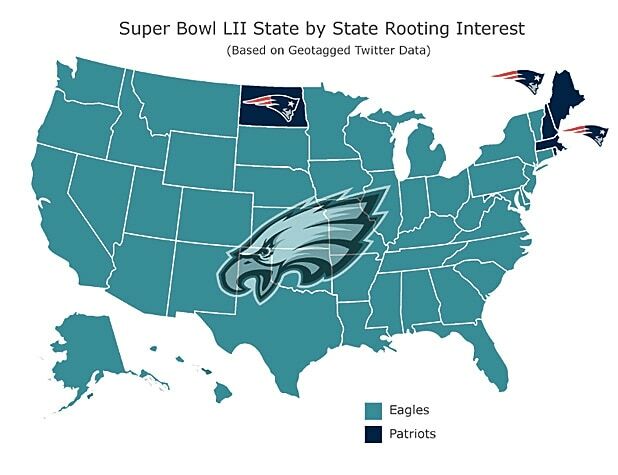 Being a Pats fan is a regional phenom. You should understand that. During a Pats game the highways around here all devoid of traffic. No parking spaces at the gin mills. Oh, sure, we have an occasional dessenter who roots for some other team for attention. You re always going to have that. New England, like Jersey, has its allocation of screwballs, often boat fishermen. If the Eagles somehow find a way to win this football game, the parade will be the largest civic event in the history of the City of Philadelphia. It will make the last parade, after the Phillies won the World Series in 2008, look like a garden party. I have coworkers already telling me not to plan on *anything* productive happening at work the following week, should the eagles win. I just hope Gronk gets to play so that we can have both teams close to full strength. ....Oh, sure, we have an occasional dessenter who roots for some other team for attention. You re always going to have that. New England, like Jersey, has its allocation of screwballs, often boat fishermen. I don't see that much politicks in football. In most cases fans follow the region in which they live. The only thing I have in common with Boston is support for the Pats. Some Boston cracker shoots his pusher and they round up the duck hunters for their guns. I would support the Pats anyway but I enjoy how Pats management craps all over the liberal Boston press who they have by the nuts anyway because what is the Boston press going to do? Favor the Eagles? Trump may not be their president but the Patriots are their team. Don't be surprised if the Pats lose if some more store fronts get kicked in. That is what Boston does when things don't go their way. What a send off was staged Monday AM when the Pats left for Minnesota. Thousands of fans, cheerleaders, muskets, fireworks, speeches. Globe sport pages, mostly free of politics, are full of interesting but irrelevant stories about Patriots players. Not to be political but that map looks like the Reagan post tax reduction voting result, down to the exact state. Weird. If the weather were better on Sunday I'd go fishing, like any self respecting Giants fan. Not keen on the kneelers either. So how do you think Philly fans will react to losing to the Pats again...with class and dignity? When sampling just the northeast, the Eagles are still favored over the Patriots by 45 percent to 28 percent. Overall, 39 percent of Americans say they will be watching on Sunday. But many don’t even care who lifts the trophy, as 49 percent say the commercials will be the most interest part. The poll also revealed something about the reputation of both fan bases. Twenty-six percent said they’d be worried about running into Eagles fans in a dark alley, compared to 14 percent who would be nervous about the same encounter with Patriots fans. spoke to a friend who lives in Camden a day or two ago , folks there are anticipating if the Eagles win the SB they will be viewing from the other side of the Delaware River many of the turned over cars set a fire in Phili by its fans a re -enactment of the 1964 riots . what really matters to us here about this SB game is that out pool numbers match up & take home some cash . Probably fall asleep & find out the results on ESPN in the am. spoke to a friend who lives in Camden a day or two ago , folks there are anticipating if the Eagles win the SB they will be viewing from the other side of the Delaware River many of the turned over cars set a fire in Phili by its fans a re -enactment of the 1964 riots. Nah, I think that things will be fine if the Eagles win. It will be celebratory, not nasty. My worry is if they lose, it could get ugly. I had the Bob Marsh post taken down at Bob's request because he was not permitted to edit it down when posting. Bob is a valued member who contributes regularly. We were just cleaning house. No big deal. I had no idea that the SB game had the potential to generate violence. makes ya wonder if we are becoming a third world country. Store fronts, overturning cars???? ..not just SB Mr. D. in other sporting events Championship wins it seems the modern day Urban Pioneers are naturalists , they don't believe in burning wood in relation to preserving the environment of cutting down trees . Its best they torch the automobile that belongs to others . The Hippies of the 60's love children have raised some bunch . Beam me up Scotty this planet is F uped .